SAVANNAH, GA – Beginning this summer, students seeking specialized careers in aviation will have a new option. Working with Gulfstream Aerospace Corporation and other industry leaders, Savannah Technical College announced the development of two new avionics certificates as part of their technical training curriculum, to begin May 2019. The new certificates were approved by the Technical College System of Georgia last week. 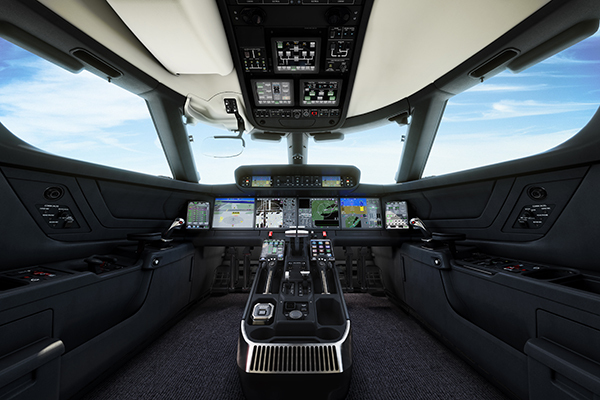 Inside the Gulfstream G500: The revolutionary Symmetry Flight Deck uses touch-screen technology that requires specialized avionics training to install and service. With a sizable pledge from Gulfstream, the college will equip its new avionics lab with advanced equipment, including 13 electronic trainers, four fully outfitted avionics technician boxes and a data bus trainer. The avionics certificates may be completed in two semesters starting in May 2019. The first semester, students will take three courses to earn the Avionics Installer Certificate (10 hours): Introduction to Aircraft and Aviation Fundamentals, Basic Aircraft Electricity and Basic Aircraft Electrical Wiring and Troubleshooting. Upon completion of the Avionics Installer Certificate or equivalent work experience, students will advance to the Avionics Technician Certificate (nine hours), which includes three courses: Aircraft Navigation, Communication and Avionics Systems, Advance Aircraft Electricity and Advance Aircraft Wiring and Troubleshooting. As avionics technicians, graduates will understand the different systems found on modern aircraft, how to do basic trouble shooting on aircraft systems and methods to integrate systems on aircraft. They could also find employment in the retrofit side of aviation with companies that are busy updating older aircraft to modern avionic suites. This program will relate to the College’s current aviation programs: Aviation Maintenance, Aircraft Structural, Luxury Craft Cabinetmaking, Upholstery and Trim, and Advance Airframe and/or Powerplant. Avionics training will give graduates a better understanding of wiring in aircraft and allow them to be better prepared to deal with current and future aircraft industry needs. Savannah Technical College has graduated 1,159 students prepared for careers in aviation since 2006, with close to 90% of them gaining employment locally. The 29,152 square-foot Aviation Training Center includes a hangar, four training labs and five classrooms with a tarmac. 5,000-sq.-ft. hangar includes hoist, portable paint booth, ground support equipment, electro tug ground power unit and engine stands. The College was granted Federal Aviation Administration (FAA) approval to teach the Aviation Maintenance Technology program in 2014. The College owns three fully functional planes and a Gulfstream G100 aircraft that are used for instructional purposes and are housed at the Aviation Training Center. Gulfstream’s support of the College’s $7.2-million campaign, “Where Excellence Meets Opportunity,” was part of the precision manufacturing priority. The campaign was led by the Savannah Technical College Foundation, a 501(c)3 organization that raises funds to support the College.